Recap from RAW: Christian dives onto Batista and they begin to fight outside of the ring while the Hurricane sets himself for a blockbuster. Thunder gets to his feet and Hurricane jumps off the turnbuckle, hitting Thunder with the blockbuster, then goes for a pin. The ref counts the pin, and Hurricane wins the match! "EAW's Superhero" |¦| Hurricane:- yeah im parched and Sodas Rule..
"Totally Not Awesome" |¦|Jonas Sharp: :- Hey look, Joey! It’s the Hurricane and Captain Crunch! Yo, I hope the two of you enjoy your little victory here tonight, because once you get in the ring with me and Joey D., it won’t be so easy. "Captain Charisma" |¦| Christian:- Joey Dynamite.....hmmm is that Napoleon Dynamites other brother or sum thing???? 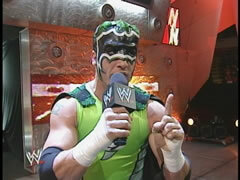 STAND BACK.....THERE'S A HURRICANE COMING THREW! "EAW's Superhero" |¦| Hurricane:- after hearing Mr. Adams making my match Me vs HHH vs. maverick it seems that it is now time to separate the weak from the chafed,.... the men from the boys,..... the awkwardly feminine from possibly team maverick......it is time for "H" & Maverick to step up and go toe to toe with the hurri-hurri-hurricane in a no DQ match live on Smackdown.....now then i think i know why theese two guys are such an angry people but its okay we understand.... we understand that "ugliness" and "fatness" are genetic disorders, much like baldness or necrophilia, and it's only your fault if you don't hate yourself enough to do something about it. "Captain Charisma" |¦| Christian:- Dude have u seen Sean Adams around? "Captain Charisma" |¦| Christian:- so have u seen any hot chicks around..
"Backstage Worker" |¦| Brian Fokker:- Yeah have you seen Kharma.....she's hott.